Shanna Wheelock sculpts, pots, and weaves in a Downeast Maine fishing village nestled amongst spruce trees and critters. She studied ceramics in the early 1990's as a fine arts student and took to weaving a few years later when awarded a fellowship. She is known as the "Easternmost Potter in the United States," and works primarily with mid-range stoneware to create unique functional pottery and sculptures. 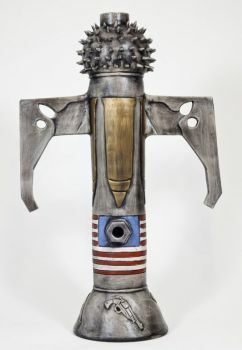 Her ceramic work has been featured in "American Craft Magazine." Shanna volunteers her time to help to build the local arts community and was featured as the narrator in the 2009 documentary film "Lubec Arts Alive." She has enjoyed facilitating workshops for women's groups, inmates, children, and exchange students, and is a state certified visual arts teacher who has taught in the public school system for many years. She recognizes the arts as a pathway to healing and is grateful for her enchanted life on the coast. 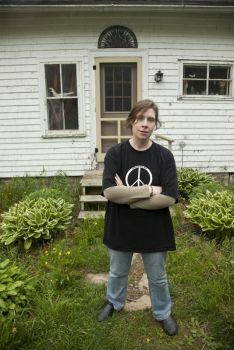 A Maine native, I came to live in a remote fishing village bordering Canada just over a decade ago. A potter by trade as well as a sculptor and weaver, the area in which I live has influenced my work on many levels. I gather inspiration from the natural environment as well as the local history and culture. My current series "Water, Wind, and Time" focuses on the deterioration of local sardine industry. Factories, abandoned buildings, war, machines, and spirit are themes that have been with me since a young age. Columbian Canning Plant, also known as Factory C, evokes images of all these things. Its war-torn appearance is indicative of battling the elements while the energy of workers who moved with machine like precision hovers in stillness. My connection to abandoned spaces harkens back to an early memory of coming home from school and seeing the old barn that I once played in being torn down. I sat on the stoop of our newly built house and watched silently from afar as bulldozers and chains razed the wooden structure. Even at nine years old I had developed a bond with the dilapidated building: its thick vertical beams, marred wooden floor, empty stalls, and cracked-glass windows. That affinity for things ancient carried throughout my work as an artist, as well as the machine-like repetition that is epitomized by the inner workings of factories. I moved to this remote fishing village when the last working factory had just ceased operation. Economic collapse and despair emanated throughout. Stories of nostalgia told of the "olden days" when wealth was as fluid as the tides. Abandoned buildings were left to fend for themselves amidst the brutal forces of nature. My work segued into an in-depth study of our community's former factory days. At first I found only small piles of debris, old bricks and shingles. These items were integrated into clay and told, more or less, the story of a once-thriving sardine industry. I connected with one of our town's elders: a ninety-four year old woman who prided herself as a former "herring choker." I initiated the interviews expecting to hear accounts of misery and corruption, but instead I was privy to stories that defined factory life as an extension of family where stability and friendships were formed. I soon felt an urgent calling to make my way to the site of the old Columbian Canning Plant. For years I had driven the main road through town and peered over tree tops at a crumbling roof. With tide and weather finally cooperating, I made my way down a snow-lined path to the shorefront construction. When I walked inside my heart skipped a beat. All the sculpture I had been creating in the past few years suddenly made sense. Heavy rectangular concrete columns, some erect and some fallen to a diagonal slant, barely supported the weight of a collapsing roof. Tangled rebar and stones poked through cement slabs. Masses of debris piled itself along the interior. It amazed me to know that this was not a war-torn village and that these walls and ceilings did not collapse because of bombs. Merely, it was water, wind, and time that eroded. Outside, weathered pilings emerged from the sand as if they were guardians watching over the remains of the factory. There was a silence and a sacredness that settled deep. My connection to these buildings inhabits a space in my soul. I think of the energy in the materials, the tree that was sacrificed for the lumber, the hands that mixed the concrete, and the experiences of the bodies that once filled the space. Repetition can be reclaimed. It yields a statement against the Mechanism in which we are slated to conform. Although I find peace in art's repetition, countless souls suffer to keep our mechanized world functioning. Mechanization in this mode is a psychotic trajectory, extending from factory to war to fanatic ideologies, whether religious or avaricious.